I’ll put my hands up: I’m not a gamer, and I have never used a virtual reality headset before. It was therefore with some apprehension as well as genuine excitement that I approached playing in the Virtual Reality Arcade and Interactive Exhibition at Sheffield Doc/Fest. Oscillate is the brainchild of Brendan Walker. A former military aeronautical engineer turned interactive designer and visual artist, he is well-placed to bridge the gap between science and art. He recalls that his first time using virtual reality was the Trocadero in Manchester in the early 90s; I now feel like even more of a luddite and park my penny-farthing outside in order to give this new-fangled technology a go. 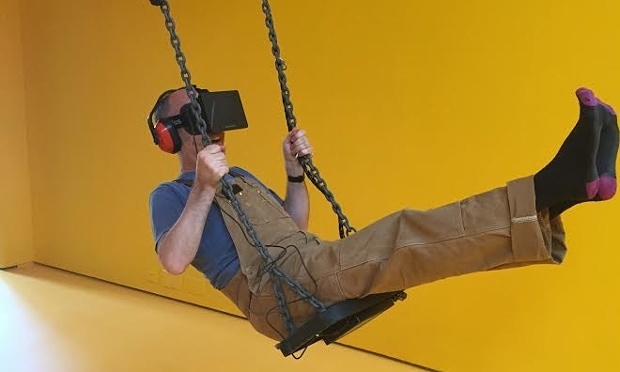 Using a combination of an Oculus Rift Virtual Reality headset and a good old fashioned swing, Brendan has designed an entirely new experience, a “ride” on which lasts three minutes (less if you get queasy). I suffer some last-minute nerves and wonder if Brendan might have a go first to put me at ease. He duly obliges, and his obvious delight spurs me on well, that plus the knowledge that I can just put my feet down and close my eyes to make it stop. Despite never having used the Oculus before, I found it surprisingly easy to come to terms with having my limbs disappear from sight even though I could feel them. The familiar, comforting sensation of my legs swinging back and forth trying to get some height on my swing did at one point give way to slight panic as the illusions Brendan had built in included a looming ceiling. At one point I also had a slight “cybersicky” moment when I ill-advisedly turned my head to look behind me, but apart from that it was a great experience. In fact I appear to have enjoyed it so much that my laughter apparently attracted quite a bit of attention in the gallery. Creating a thrilling experience is what Brendan likes to do best, and technology allows him to do this. Although they first developed a headset in 2012, Oculus VR is set to ship its first commercial headset in 2016. Brendan uses a DK1 in his work, which is the very first version of the Oculus, something which annoys a few tech purists but, as Brendan says, “we have only just started finding out what this technology can do, so for me it’s all about masking and being able to paint a picture, nothing more”. Having said that, the specific neurological requirements of this type of “masking and painting” need to be respected in order to ensure the user experience is what he intends: “I know about the response time between the visual stimulus and the vestibular stimulation: if there’s a rip of any more than 40 milliseconds then you start to feel the disparity between the real and virtual and that causes a sense of nausea” He is also working on a project funded by the Wellcome Trust around vertigo and vertiginous architecture, and he’s acutely aware that some people may not like that experience. His usual remit tends to be further towards the vertiginous end of the spectrum, as he also works as a consultant for theme parks. Many years ago Karen started training in freerunning (also known as parkour) and felt that “it alters your sense of identity, it empowers you”, so wanted to try to give users a similar adventure. Housed in a giant inflatable igloo, Syncself 2 is a cosy set-up: there’s a widescreen TV and a comfy couch. Karen settles the EEG headset on me and makes sure my brainwaves are being picked up by the system. She explains what will happen and I am given a warm up session. This involves no physical effort, but rather watching some free runners on the screen and concentrating on my breathing to get an idea of when I might be focused enough to try the game. On my first go I fail abysmally at level one and my runner doesn’t make the jump. Karen gives me a pep talk in which she asks me to explore what makes me as an individual focused and motivated. On my next attempt it all clicks into place and I sail through all three levels. My win leaves me feeling elated and strangely calm all at once. While Oscillate’s use in the real world could perhaps be to develop more thrilling rides and experiences, Syncself 2 relates more to wellbeing and mindfulness. Karen tells me of a freerunner friend who tried the game when it was at the V&A and who used the technique to help her complete a real life jump she had been struggling with. Certainly the EEG headset is already being used as a brain training device, by those who have limited physical control and, of course, gamers. Karen is also in talks with Starlab in Barcelona, a company that specialises in neuroscience research, looking into diseases like Parkinson’s and dementia biomarkers, amongst other things. It’s exciting, and could relate to the next stage of Syncself which she is working towards: Futureself, which will use biometrics to help people alter energy levels and mood. Interestingly, both Brendan and Karen are a bit sceptical about tech as individuals, but as artists they are both committed to it. Brendan thinks seeing artists like David Hockney and Grayson Perry working with tablets is just the start: “I think the more these tools are used creatively the more it will feedback and technologists will enrich those creative processes and keep creating for artists: it requires a critical mass of people doing this.” For Karen, “science and art go hand in hand; if you can find a way for synergy I think that’s really exciting”. Personally speaking, if this is the future of gaming and rides, I’m a new convert.